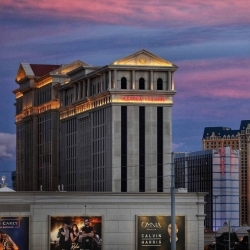 Though Caesars Entertainment is dealing with debt issues, it still owns more US casino properties than any other company. Caesars Entertainment Corp. and DraftKings entered into a deal today which should give America’s No. 1 daily fantasy sports operator access to sports bettors in 14 US states. The deal includes Caesars Entertainment buying an equity stake in DraftKings. Terms of the deal do not mention how much equity Caesars will own in DraftKings, but it does state that Caesars will get a cut of DraftKings’ sports betting revenues. In return, DraftKings will become active in multiple US states with sports betting. At present, the Boston-based daily fantasy sports operator has access only to New Jersey, where it operates sportsbooks for —- and launched a live sports betting app. Caesars Entertainment is the largest single owner of casinos in the United States, with 37 land-based casinos spread over 14 US states (and 50 casinos in all around the globe). Not all of those 14 states have legal US sports betting, but the deal gives DraftKings access to Caesars’ casinos in Nevada, Mississippi, Maryland, and Delaware at present. The list of states with legal sports betting is expected to grow in the coming years. In all, 11 states have some form of legal sports betting, while 29 other states have introduced bills which would legalize sports betting. Not all of those legislative efforts will success, but JP-Chase Morgan predicts 32 US states will have legalized sports betting by the year 2025. If that is the case, the deal means DraftKings could be active in as many as a dozen states in the coming years. Eilers & Krejcik Gaming estimates that the American sports betting industry could generate as much as $6.5 billion in revenue by 2023. The May 14, 2018 Supreme Court decision which struck down a federal ban on sports betting appears to have created a frenzied period of business activity and consolidation, as companies position themselves for the multi-billion dollar industry with mergers, buyouts, and strategic partnerships. DraftKings was launched in late 2011 and early 2012 by several Boston roomates, including Jason Robins, the current CEO of Draftkings. By that time, Scottish-backed and New York City-based daily fantasy sports operator FanDuel had been in business for two years. The UIGEA law left a carveout for fantasy sports and the two DFS operators exploited that loophole to launch daily fantasy sports businesses. Where previously, local leagues had year-long contests involving a prize pool collected from 8 to 16 league members, now fantasy sports could be played in one-day events. A single player could enter multiple (or dozens of) DFS contests in a day’s time. For DraftKings and FanDuel, the business was lucrative. By 2014, the two companies were receiving investments from Wall Street investment firms, venture capitalists, and sports entertainment businesses. Comcast, NBC Sports, and a variety of financial institutions funded the two companies. In their turn, DraftKings and FanDuel used that money to fuel an advertising war to secure top spot in the United States daily fantasy sports industry. By October 2015, DraftKings and FanDuel were on the verge of becoming billion-dollar companies, but they had done so at a price. As daily fantasy sports became mainstream, its pervasive ads alienated some in the sports viewing audience and got the interest of state attorney generals and US attorneys offices. When the Ethan Haskell scandal broke, a wave of US officials began to put daily fantasy sports under the microscope. In retrospect, the scrutiny caused the daily fantasy industry to grow up. Where Nicel Eccles, Jason Robins, and their counterparts had fought for years to keep daily fantasy sports from being associated with sports betting — to avoid regulation of any kind — they were forced to embraced regulations in order to avoid being banned outright. Over the course of 2016 and 2017, the two former rivals found themselves working together on legal cases and lobbying efforts. At one point, FanDuel and DraftKings negotiated a merger, only to have the SEC strike down the merger due to monopoly concerns. The real transformation was to stop pretending daily fantasy sports had nothing in common with gambling. While most states which regulated DFS decision their contests were games of skill and therefore not “betting”, the lines were blurred betwen gaming and gambling in the public sphere. Once the US Supreme Court repealed the PASPA sports betting ban, the companies were ready to embrace the fact they have promoted a legal form of sports betting all these years. Paddy Power-Betfair bought FanDuel, which designed a sports betting app for the New Jersey gaming market. Now anyone inside New Jersey who wants to gamble at the Meadowlands Racetrack’s online sportsbook uses FanDuel’s live sports betting app. The same happened with DraftKings. The company signed partnership deal with Resorts Casino and now is sportsbook operator in the area. How the deal affects Caesars’ three Atlantic City casinos — Caesars Atlantic City, Harrah’s, and Bally’s — has not been announced.